Three Castle Head Farm is a unique property located on the edge of the most South Westerly peninsula in Ireland. 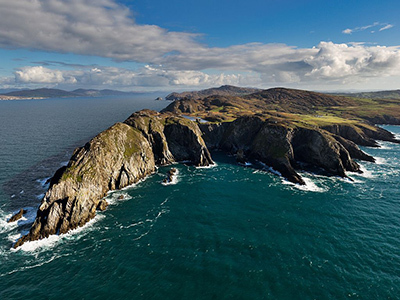 It commands stunning views of the rugged Irish coastline and the Atlantic Ocean. The farm includes 250 acres of land on which sits the 12th Century Dunlough Castle, one of the earliest promontory forts in Ireland. 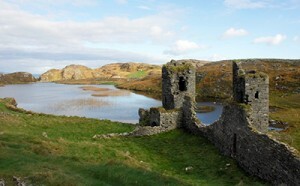 The Castle itself is perched on the edge of awe-inspiring cliffs with a large freshwater lake to the one side. Three Castle Head is a working sheep farm run by Lukas and Joanne Ungerer. It has been the Ungerer family’s home since the mid nineteen seventies when they moved to Ireland and more recently has been expanded to include a café and holiday rental conversions. It now serves as a venue for weddings and various private events and is also available as a unique location for photo shoots and filming. 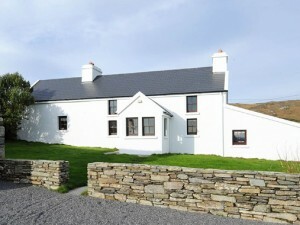 Three Castle Head Farm is located just off the well-known Wild Atlantic Way and is a stones throw from the popular Mizen Vision Lighthouse, Barley Cove Beach and the charming fishing village of Crookhaven. There is plenty to occupy visitors of all ages here no matter what the weather. A car park is open to visitors during the summer season. 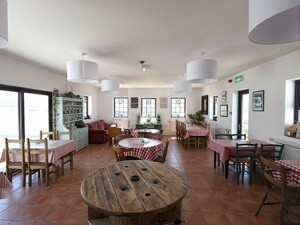 The Three Castle Head Café is situated en route to the Castles and provides an idyllic location for a bite to eat before or after your visit. The café itself combines an informal and charming ambience with a rustic aesthetic. Great quality, locally sourced food is prepared on site –including lunches, cakes, teas and coffees.